My students arrive to eighth grade with a fairly strong knowledge of one- and two-step equations. This year with the new seventh grade curriculum my standard math students are coming to me having never solved an equation with the variable on each side. 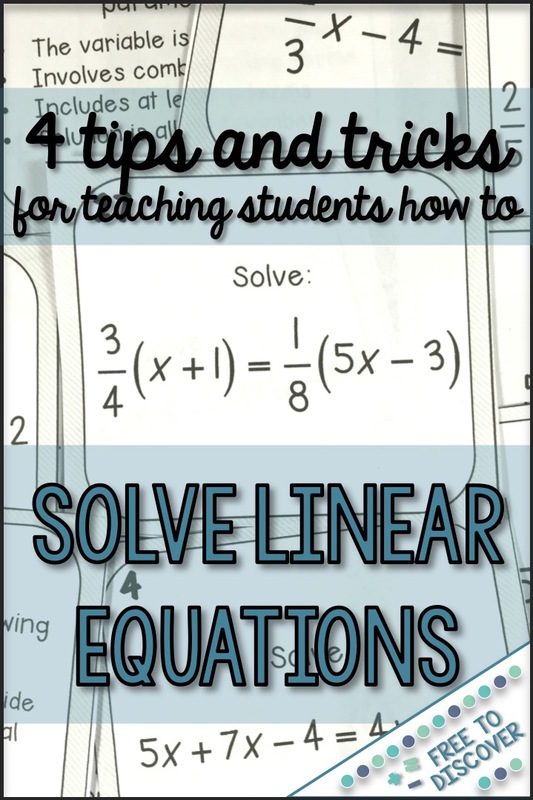 Within a couple of short weeks, we will review two-step equations, discuss equations that involve the Distributive Property and Combining Like Terms, solve many equations that have the variable on each side; including those with fractional coefficients and special solutions, and study word problems with scenarios modeled by linear equations. 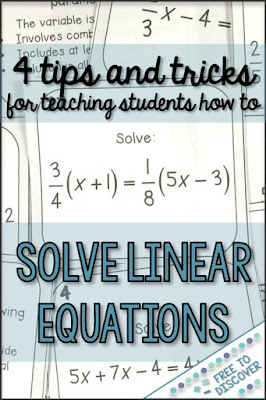 Solving linear equations is an immensely important skill for middle and high school students to master. It is imperative that students understand what they need to do and why they need to do it. In this post, I would like to share some of the strategies and resources I use in my eighth grade math classes. Whenever possible, I try to relate what we are doing in class to something students understand in their own lives. Last week I compared equation solving to putting on socks and shoes. In the morning when getting ready for the day, socks go on first, then shoes. But at the end of the day, shoes come off first, then socks. The same is true for equations. Consider the equation 3x+1=-14. When the x “got ready” using order of operations, it would have been multiplied by 3, then the 1 would have been added. So to undo the operations, start by removing the 1 and then the 3. I have used this analogy year after year and it has proven an effective strategy for my students. I require very clear equation-balancing evidence – even for one-step equations. I want students to understand why they can add/subtract/multiply/divide. Very quickly we move from one-step review to solving equations with four or more steps. I have found that students who are lazy about showing their work in the beginning of the unit tend to flounder when they have many more steps, variables, and numbers to keep track of. I have also seen many more errors with integers and incorrect operations when the work is not clearly done out. There are always some moans and groans, but I know that it makes a huge difference a week later. 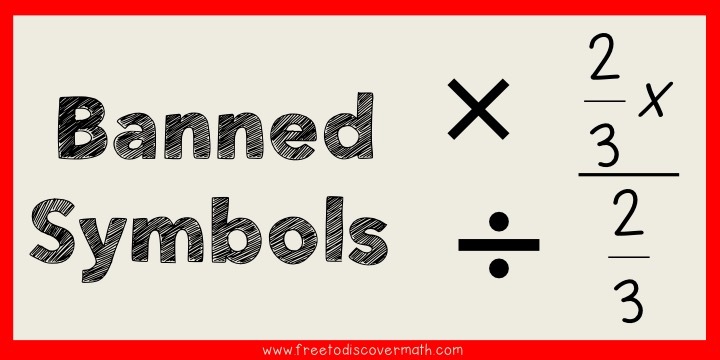 When students are showing their beautiful work, I ban some of the symbols they may have used in the past. I “joke” that we are “breaking up” with them and that it won’t be their last break up. Eighth graders find it shocking that I bring in the idea of relationships and it captures their attention. I do not allow students to use “x” for multiplication when solving. It can get confused with the common variable, and parenthesis are a better way to communicate multiplication. I do not allow the traditional “divided by” symbol either. I urge my students to use the fraction bar to show their division. I had a student tell me last week that he didn’t like the fraction bar because then he couldn’t tell whether it was a fraction or division. Ahh! I gave a couple of basic examples to show that they represent the same thing. Finally, I do not allow students to divide by a fraction. I require multiplication by the reciprocal. I help students buy-in by demonstrating how it actually saves them time and work if they multiply directly within their organized steps. I am a big fan of balancing discovery-based learning and traditional practice. Special cases can be challenging to understand. I group “x=0” in with special cases because it often is confused with no solution. To help students build meaning and understand no solution and all real numbers, I created discovery-based worksheets that lead students to the big ideas. They learn, not just what to look for in order to identify the special solutions, but what it actually means for there to be a special solution to an equation. I use a similar approach when teaching students about equations that involve fractions and decimals. I created a discovery-based worksheet that walks students through how to clear out fractions and decimals from equations. They learn how to select the factor they should multiply by on each side of the equation, and they clearly observe how much easier an equation can be to work with when taking the time to clear out the fractions or decimals from the start. Holiday-Themed Partner Practice: My first few years of teaching, holidays would roll around and I would get so excited! I wanted to acknowledge the holiday in my classroom, but I could never find anything mathematically meaningful. That’s why I decided to create my line of holiday-themed partner stations! Students travel in pairs as they each solve a different problem. If they are correct, they will have the same answer as their partner. Great self-checking activity. Fun unscrambling component at the end, too! Front Whiteboard Practice: My eighth graders love to write on my whiteboard. I call five students up to board at a time. Everyone else has paper and pencil out so they continue practicing even if the spotlight is not on them. I read an equation aloud that everyone solves at the same time. I switch up which students are at the front board so that everyone goes up 2-3 times. Mini-Whiteboard Practice: I have a set of mini-whiteboards to use with my classes. Students solve an equation on the board, then when I give the signal they all hold up the boards with their work and the answer so I get quick feedback on the level of understanding in the room and I can pinpoint students that I should check in with. Task Cards: I love task cards! My favorite strategy for task cards has been to leave them in a bin in the front of the room with the answer key posted nearby. Each student takes one card, checks their answer, and replaces their card with a new one once they get it correct. I have done this individually or in pairs. Scavenger Hunt: I purchased a CSI-type scavenger hunt to use with my students. I hid the “clues” around our Auditorium and we took a “field trip.” Students loved getting out of the regular classroom setting, working at their own pace and in an unconventional way, and filling in the answers to the mystery during the process. Thank you 21st Century Math Projects! This post is also featured on the TpT blog!